Four story contemporary office building owned and operated by BMS Management. Elegant atrium with marble lobby finishes and lush landscaping. Conveniently located in the Energy Corridor off I-10 between Dairy Ashford and Kirkwood. Easy access to I-10 and Beltway 8, approximately 25 minutes from Houston Intercontinental (IAH) Airport and Hobby Airport (HOU). Numerous hotels and restaurants exist within the neighborhood for both employee dining and entertainment of clients. Our staff has worked for the company for over 16 years and due to our experience and long-term relationships with our clients, we are able to provide a more personalized service. We offer efficient secretarial services, personalized telephone answering, voice mail, high speed internet, photocopying, faxing, coffee, tea and soft drinks. 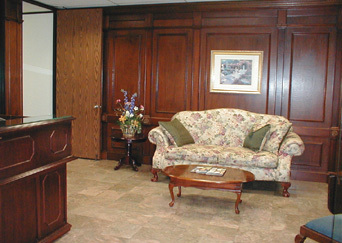 The best way to see if Woodbranch Executive Suites offers the caliber of executive suite for which you’ve been looking, is to see them for yourself.